Biography of Spanish Baroque Sculptor, Wood-Carver. One of the great Spanish Baroque artists, the sculptor Juan Martinez Montanes was known as 'el dios de la madera', the God of Wood. He excelled in the art of wood carving, and sculpted mainly wooden crucifixes and religious figures. One of the finest Baroque sculptors in 17th century Spain, he spent all his artistic career in Seville, occupying there a role comparable to Gregorio Fernandez in Valladolid, except Montanes was more aristocratic in style, tempering Baroque emotionalism with classical dignity. His best known works of Christian art include The Merciful Christ (The Christ of Clemency) (1603, Seville Cathedral) and the Santiponce Altarpiece (1613). Ranked alongside other important Spanish sculptors like Alonso Berruguete (1486-1561) and Juan de Juni (1507-1577), he influenced a generation of artists in Spain including Velazquez, Zurbaran and Alonso Cano, His works can be seen in churches and some of the best art museums in Europe. Montanes was born in 1568 in Alcala la Real, Seville. At some point early in his life, he moved to Granada to study the art of sculpture in the workshop of Pablo de Rojas. Rojas, one of the late Renaissance sculptors, was an important figure in the Spanish art world; his style influenced the evolution from Renaissance to Naturalist and eventually paved the way for the Andalucian Baroque movement. After completing his apprenticeship, Montanes returned to Seville, where he would remain working, except for a brief visit to Madrid, for rest of his life. In 1603 Montanes created one of his masterpieces of Baroque art, namely The Merciful Christ (Seville Cathedral). 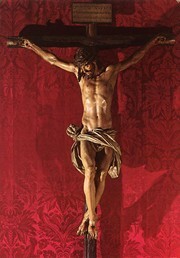 This is a polychrome painted wooden sculpture of Christ on the Cross. The written contract between Montanes and the Cathedral in relation to this artwork still survives, and within it is the specific iconological theme that he was to follow. Christ should, the document stated, be attached to the cross with four nails and he must be represented barely alive, just before dying with his head leaning towards the right and looking at a faithful believer kneeling at his feet'. In 1610 Montanes was commissioned to carve the statue of Saint Ignatius Loyola, founder of the Society of Jesus (Chapel, Seville University). The statue is fashioned from a plaster-cast death-mask and is supposed to be a life-like portrait. Francisco Pacheco, a former student of El Greco, painted the sculpture on completion. Even then, Montanes would not consent to any of his figure being 'tinted' except under his direct supervision. The portrait is an excellent example of Montanes style - which is considered more realistic than imaginative, and is produced with a delicate, impeccable taste. In 1612 he completed the life-size statue of St. Jerome, one of his finest works, for the Hieronymite monastery of S. Isidro del Campo, near Seville, along with a number of reredos and statues for the altar. In 1614, he created the famous large crucifix for the Carthusians of S. Maria de las Cuevas. Montanes most beautiful works were created when he was younger - this may be because as he became more successful, he employed assistants to keep up productivity levels and finish works. Gradually a baroque element started to appear in his art, and this can best be seen in the great altar of St Jerome at San Isidoro del Campo, Santiponce, near Seville - known as the Santiponce Altarpiece (1613). Figures are carved into wood as reliefs depicting various scenes from the Gospel. The composition is classical, while highly realistic and dramatic. To learn how to judge artists like the Spanish Baroque sculptor Juan Martinez Montanes, see: How to Appreciate Sculpture. For later works, please see: How to Appreciate Modern Sculpture. In 1620 Montanes created the figures of St John the Baptist and St Bruno (Carthusians of S. Maria de las Cuevas Museum). In 1635 Montanes spent three months in Madrid modelling a portrait of Philip VI, which was subsequently sent to Florence so that the sculptor Pietro Tacco could produce a bronze equestrian sculpture version. During this stay, the famous artist Diego Velazquez painted Montanes portrait (Prado Museum, Madrid). Montanes died in 1649, leaving behind a wife and large family. Several of his sons would go on to be sculptors and painters in their own right. He also left behind a flourishing workshop, which would continue to spread and work in his realistic, dramatic style. Montanes also influenced painters such as Velazquez and Zurbaran, as well as sculptors like Alonso Cano (a former pupil).  For more about sculpture in Spain, see: Homepage.